First of all, I must apologize for my daughter's rather unfortunate bang situation. A few months ago I went a little crazy with the scissors while trimming her bangs and all of a sudden I realized she was bordering on full-on mullet status. (Apparently I forgot that bangs aren't supposed to start at the back of ones head. Who knew?) Cutting a toddler's hair is difficult in any way, shape or form—but throw in a mother who is a raging perfectionist and must always cut just one more small piece and these bangs will be her true crowning glory, glory hallelujah!—and things tend to end up a little, how shall we say…askew. Jay should have snatched the scissors away from me when he had a chance. But alas. Since then, we've had to deal with the "real" bangs, the grow-out bangs and the rest of her hair. Such a joy! 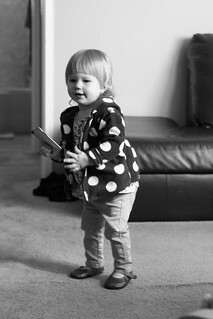 Anyway, I snapped these photos a few weeks ago before we went out for our Saturday family adventures. Eisley has proven to be a true country music fan, typically choosing two songs out of the hundreds on my iPod: "Drunk on You" by Luke Bryan (or, as she calls it, "Boom Boom") and "Cruise" by Florida Georgia Line. Her dance moves are hilarious because she sways back and forth and takes it all so very seriously. I feel like it's time to introduce her to Creed, just to see the look on my husband's face when Eisley and I can sing the entire Human Clay album by heart. It's okay; you can judge me. I judge myself a little bit. 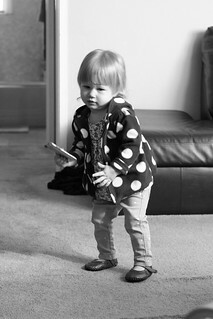 SHE IS GROWING TOO FAST. Tell that cutie to cut out. I look forward to a future dance break with her though. :) hehe. Someday. 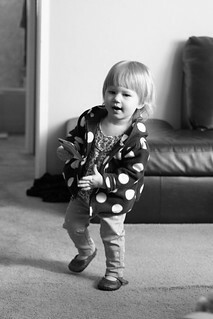 Toddler dancing is the BEST. 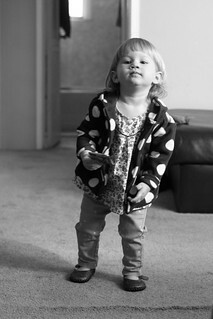 Eisley is totally getting down in those pics! Meredith's favorite song is "Some Nights" by Fun. It will always, always make me happy because she immediately starts bouncing when she hears it. Haha, cute! Gosh, I've ruined my own bangs so many times I legitimately fear for my future child's hair. Aww, I love her bangs! Even if they're a little short.